Before I booking our hotel for our Cebu trip this coming November, I already booked our Panglao hotel through booking.com. Prior to this, I didn't consider booking our hotel through booking.com much more consider Panglao Regents Resort as our home for our three day-stay in the island of Panglao. I later realized that the booking was my spur of the moment decision as I was swayed by the “discount” that can be availed through the site. Like with TravelBook.ph, I didn't have an account with Booking.com so I created an account with them first prior to making my booking. Also, it is mandatory to confirm your email address before confirming any booking. Reserving your hotel with Booking.com is pretty straightforward. First, you have to enter your trip details such as destination/hotel name, check in/ check out date and number of guests in the search box. After hitting the “search” button, you will be given the list of hotels available for booking through them. You can then categorize the listing by recommendation, prize, stars, location and review score. With the stars and review score, it isn’t difficult to determine whether the potential hotel is of good quality or not. After you have chosen your hotel, hit the “reserve” button in which you will be taken to another page wherein you will be required to choose the type of room you want and the number of rooms you want to reserve. After clicking the reserve button, you will then be taken to the final process which is to choose your payment method and input necessary details (credit card number, etc). Reserving a hotel room through Booking.com doesn't take more than 10 minutes if you already have an account and you already have a preferred hotel in mind. After your credit card is approved, you can access your current booking from your account with them. They will also send you an email about your confirmed booking. With sites such as this, it makes booking a hotel and traveling in general less stressful. With just a few clicks on your computer and the purchasing power of your credit/debit card, you will have a guaranteed place to stay during your travel. On my next post, I will be caring TravelBook.ph and Booking.com so watch out for it! Hi!is it safe to use booking.com?i plan 2 visit bohol several months from now and im quite hesitant to use this booking site..as it is my 1st time...any advice? Hi! Thank you for reading my post. 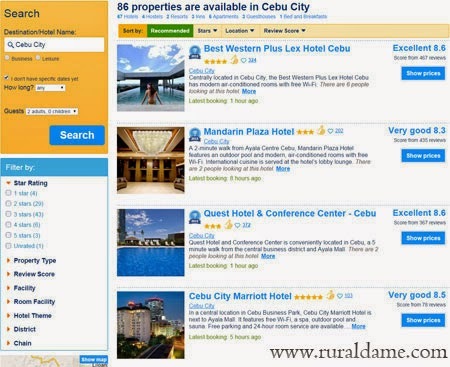 Bohol is a lovely travel destination and yes, booking.com is safe. When paying using credit card, the hotel will ask you for it (for verification) when you check in and have you signed the receipts.